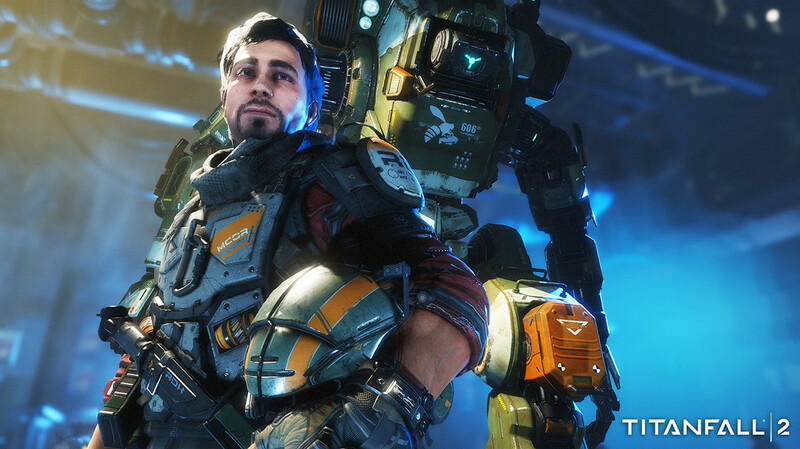 A month out from the launch of Titanfall 2, Andi chats with Respawn Entertainment art director Joel Emslie and COO Dusty Welch. Q: I was a huge fan of the campaign in Call of Duty: Modern Warfare, so as a PlayStation gamer I'm really excited to see this series come to the PS4. Emslie: We were there on Call of Duty 4, and I have a very weird, kinda familiar feeling that I've had on Titanfall 2 which I had when we were doing Call of Duty 4. This game almost feels like a spiritual successor to what we had done; the types of things we had done in those days. So it's pretty exciting to be at this point... to have a single player and to be releasing to Sony. Q: There was a narrative and established world in the first Titanfall, despite there not being a campaign mode. Will that be expanded upon in Titanfall 2, or will you cover that again for those that missed out? 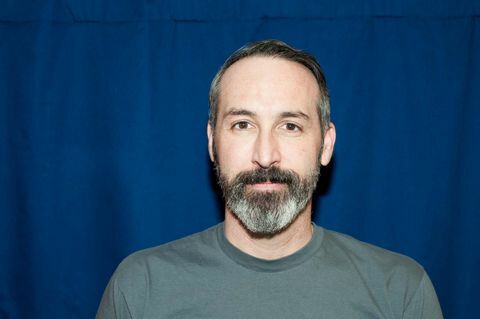 Respawn art director Joel Emslie. Emslie: When we approached the development of Titanfall 2, we still had the campaigned multiplayer, which was a really cool idea and a fantastic experiment. But there were things that were good and bad, and we quickly realised that if we're going to really do the type of narrative that we wanted, then we needed to actually bring that part of the game out to be its own thing and to stand on its own legs as a single player experience. For the people that have played Titanfall before, there's a lot of backstory and lore that will be present in Titanfall 2. With that being said, we treated this as if it were a first entry in the series, and you're almost starting the game here. The mechanics, the way it plays – even the story is very friendly to first-timers. Q: So those that have played before will have an enriched experience with Titanfall 2? Welch: It's important to us that we're telling the story of the universe. It was one of the great learnings of the first game in that we gave kind of a light overview and introduced people to Titanfall, but people really gravitated to the story and wanted more of that and wanted more depth, so single player was really the only way to get that across. Our team's obviously got the chops. They've made some of the greatest moments in Call of Duty with the likes of 'No Russian', and 'All Ghillied Up'. That stuff is near and dear to us, and one of our current single player designers came up with those. So having that kind of team working on this campaign really gave us the chance to tell the story of this universe and paint this picture of this 'better together' nature with a Pilot coming together with this bespoke Titan BT-7274, and then how they progress throughout this campaign narrative. We like to say that this game is more of an action-adventure story. It arcs, and has you doing things that you've never done before. When was the last time you had a single player campaign that was so engaging and rich where level by level it changes the mechanics of what you're doing? Half-Life 1 comes to mind the most in regards to what this campaign reminds me of. Emslie: When we reference Half-Life 1, and the vibe and inspiration from it... Titanfall tends to tell its story on the move. We're a little reluctant to lock you into a pre-rendered cut scene, we like to tell the story while you're immersed in the environment. Q: How liberating has it been to leave the previous generation of consoles behind? Emslie: One of the things I'm most excited about is adding physical-based rendering. We've shown an image of Angel City – a level that we're actually remastering for Titanfall 2 – and to actually see those two side-by-side and to see the graphical improvements right there front-and-centre is pretty awesome. We've added a whole new audio system, we've added depth of field and all these things... it feels really good to take advantage of this technology, but at the end of the day artwork is approached the same way. We just really focus on making sure the core artwork can look good without all those bells and whistles. When you get to put them all on there it just enhances what you're looking at. Q: A lot of the campaign's emphasis is on the relationship between the Titan and the Pilot. Are there any specific touches that have been made to help develop that? Emslie: I think one of the coolest things that helps bring BT to life is that he's a lefty when you're not driving him, but he's a righty when you're piloting him. He's like our prime version of a Titan in this game, and we had to go the extra mile with animation, with audio, with the way we rendered him to really get that personality across. We wanted to create a character that you actually wanted to be around. So in the early days with BT, sometimes he was too bossy, sometimes he was too passive. We were trying to find his personality through animation and experimenting with him and how he fits into that world. What we ultimately ended up with was a character that, even though he's a giant robot you still develop an emotional attachment to him and by the time you're halfway through the game you really feel like a camaraderie with him. Knowing what I know about the game, I find myself trying really hard to prove myself to this AI and seek his approval. In any good story you need to know what you're fighting for... there has to be a reason. You don't just go into an environment for no reason, and BT is that character that reminds you why you're there to do these crazy things. Q: There are number of futuristic shooters out there – these days that even includes Call of Duty. How have you made the world of Titanfall stand apart from the rest? Emslie: Even when we were designing the box cover and the key art I was anticipating the next move from our competitors, and so for me the visual direction was to step as far away from what they were doing as we possibly could. At the same time we were careful not to compromise the elements that made the first Titanfall so cool. We're in an exotic universe in Titanfall 2 with crazy environments, huge set piece moments that you're wall-running through and doing these insane Titanfall-esque platformer moves, as well as insane combat. Visually I went with as vibrant and as colourful as I could possibly get the team to go for, but our game director (Steve Fukuda) really came up with a great idea early on – he said we should approach the environments in the world of Titanfall as if you could send postcards from these areas and have that picturesque 'postcard moment'. You could go into an area and think 'holy... what am I looking at? That's absolutely insane!' So we went for the really crazy massive environments that really seem to go on forever. Q: We've just seen the announcement of the Titanfall: Frontline digital card game, which will presumably involve micro transactions etc. Was there ever any discussion about taking Titanfall in that direction with a 'games as service' approach? 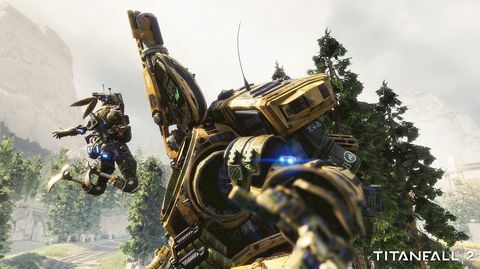 Welch: The plan for Titanfall 2 was always to focus on what we do well and our expertise, which is building triple-A franchises – particularly for the consoles and PC. That's our wheelhouse, that's the skill set that we have, and I think we only really scratched the surface with the first Titanfall. From my perspective, I'm always looking at different business models and opportunities to see if there's better ways that we can bring our game and our craft to more users around the world. If free-to-play provides the best opportunity to put our games in front of people then in the future we'll pursue that. Q: You recently had a beta framed around a tech/stress test, but was there any feedback regarding gameplay that resulted in changes? Welch: It really was a stress test, it wasn't a beta. It was really done to understand our server infrastructure and to make sure things were propped up correctly for launch, so things were really successful from that perspective. Over two weekends really gave us the chance to pull down servers, simulate DDoS attacks, and see how fast we could spin up servers. But it also gave us a chance to listen to the audience. We're a developer of 150 people, and as many times as we can bring in testers over the course of a development cycle, nothing can begin to simulate millions upon millions of players that got into the game that first weekend. We're voracious readers, so we followed the message boards and reddit. This is our livelihood, and we love playing and making games as our craft, so we take the feedback of our audience very seriously. When we get this kind of feedback we have to sit back and ask if it was an intended or unintended result – is it something that enhances our game or breaks the goals we're trying to achieve? In some cases we ended up making changes, most notably with the Titan meter. We found that it was penalising players that weren't great at accomplishing certain objectives, meaning that they weren't able to call in a Titan as quickly. So we put a passive meter in place as well, and we saw a dramatic improvement in metrics on that second weekend in terms of Titan drops, the death ratios, the length of matches... it was extraordinary. And that doesn't stop. It continues today, even though we're in certification. We'll still tweaking and adjusting the game, and we'll do that all the way through launch and post launch as well. The four laws of robotics.